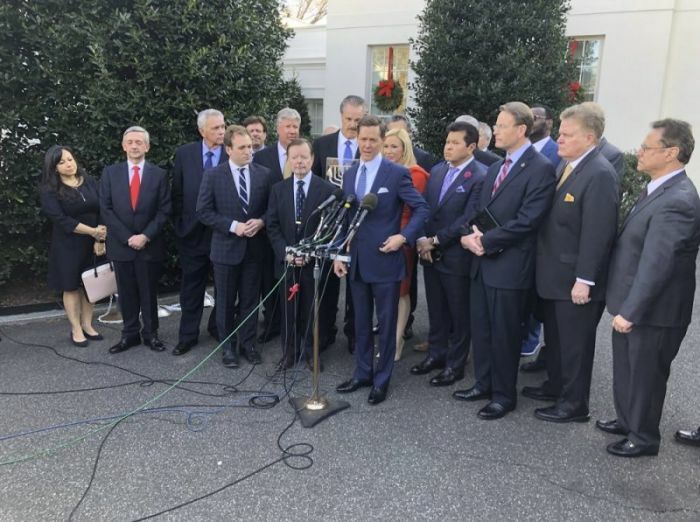 Top conservative evangelical leaders prayed with President Donald Trump in the Oval Office again on Monday afternoon and also presented him with a "Friends of Zion" award after his decision last week to recognize Jerusalem as the capital of Israel. Evangelical leaders who have been involved in advising the Trump administration participated in an end-of-the-year briefing that included comments from Vice President Mike Pence, White House advisor Jared Kushner and Trump's daughter, Ivanka, a participant in the meeting told The Christian Post. Evangelical figures such as Family Research Council's Tony Perkins, James Dobson of Family Talk Radio, televangelist Paula White, Dallas megachurch pastor Robert Jeffress, African-American pastor Harry Jackson and former Southern Baptist Convention president Jack Graham joined other evangelical leaders for what has been described as a "working lunch" in the Eisenhower Executive Office Building. Perkins told CP in a phone interview that during the lunch, he and the others were told all about the list of things that the Trump administration has accomplished for social conservatives and evangelicals during his first year in the Oval Office. 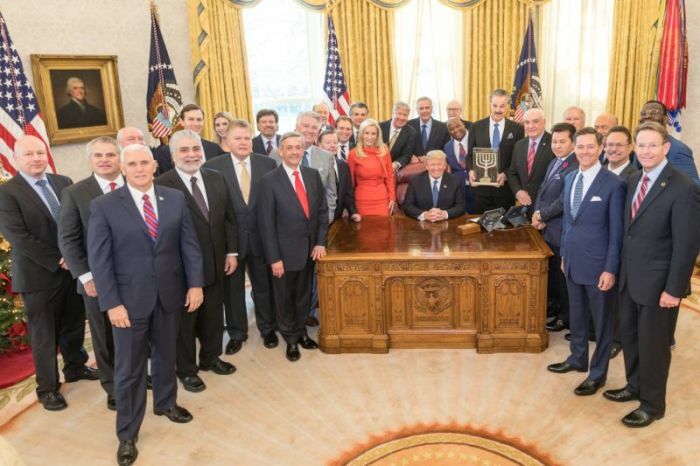 After the meeting in the executive building, Perkins said that evangelical leaders made their way to the White House for a meeting in the Oval Office that lasted about 15 to 20 minutes and ended with them praying with the president. "We had an incredible meeting," Dobson said during a press conference after the meeting. "There is a great deal of love between these evangelical leaders and the congregations that they represent and I think the president in return." During the press conference outside the White House, Perkins stated that Trump "keeps his promises" and assured that rank-and-file evangelicals are supporting Trump even though recent Pew polling has suggested that Trump's job approval among white evangelicals might not be as strong as it was at the beginning of the presidency. "Evangelicals and conservatives across this country are grateful for the fact he has actually done exactly what he campaigned on," Perkins explained. "He campaigned on protection of religious freedom. He campaigned on making our military strong and reversing the radical social policies of the previous administration. He has focused on making our economy strong again. In short, he is working to make America great again. Despite what some might say, the rank-and-file evangelicals across this country applaud the president, believe in the president, and continue to stand with the president in seeing his agenda accomplished." One of the main points of discussion during the meeting was Trump's decision last week to recognize Jerusalem as the capital of Israel. During Monday's meeting, Trump was given the Friends of Zion Award presented by the Friends of Zion Museum in Jerusalem. Dr. Mike Evans, founder of the Friends of Zion Museum, proclaimed at the press conference that "no American president in history has done more to defend the Jewish people in the United Nations" than Trump. In addition, evangelical communications executive and human rights advocate Johnnie Moore tweeted out a photo of a letter that was signed by evangelical leaders praising Trump for the Jerusalem decision. "We stand together united today in firm support of the President's commitment to peace in the Middle East and in celebration of his historic decision to designate Jerusalem the capital of Israel," the letter reads. "This distinguished 'Friends of Zion' award is a symbol of our appreciation to President Donald J. Trump as we remain unrelenting in our prayers for the peace of Jerusalem." Perkins told CP that Monday was probably the third time that he and a group of evangelical leaders had met with Trump in the Oval Office. In July, evangelical leaders faced criticism after a photo was posted to Twitter by Moore that showed evangelical leaders laying hands on the president in prayer in the Oval Office. Others who participated in Monday's meeting are Faith & Freedom Coalition's Ralph Reed and conservative activist Gary Bauer. Following the meeting, Pence tweeted out his appreciation for the evangelical leaders support. "@POTUS & I STAND w/ people of faith. Honored to meet faith leaders to review what POTUS has done to protect life & people of faith," Pence wrote. "Also previewed my Middle East trip where we will discuss relief efforts for persecuted Christians & others persecuted for their faith in the region."